How many people will generally be seated at the table and the number that will expand to when entertaining? What is the size of the patio space? The type of patio surface – concrete, flagstone, pavers, wood, etc. Is it smooth or rough? Where are entryways and other “considerations” such as the grill or outdoor kitchen, exterior doors, windows, columns, walls, etc.? Note where the patio or deck edges are in relation to the considerations. And if you have a swimming pool, make sure your guests won’t be taking an unexpected plunge! What is the shape of the patio or deck? Is it square, rectangle or free-form? Now that you’ve made note of these things, it’s time to think about the type of table you will need and how much space will be needed. Is there a style that you prefer? Rectangle, oval, round, square? What about the type of table base? Legs, pedestal, trestle or cross-beam? A round table will make your space feel cozier and more intimate with the added benefit of flexible arrangement around the considerations you defined earlier while a square table gives your diners a little more elbow room. The same can be said for rectangle versus oval shapes. Round tables as a rule are available in sizes as small as 24 inches (for 2 people) up to 60 inches. Square tables in general are available as small as 30 inches (for 2 people) up to 64 inches. Rectangle tables can be as small as 40 inches in length up to 102 inches. Oval tables are typically a minimum of 60 inches in length up to 84 inches. As you can imagine there is a table for any size patio! There are various types of table bases available for all shapes; each with benefits and drawbacks. Round tables are frequently supported by a pedestal base which provides a greater space underneath the table for your diner’s comfort; however, some round tables are supported with post legs in a square pattern. Depending on the size of the table and chair, you may be able to pull in an additional chair if needed with a pedestal base. Square tables are generally supported with a post leg in each corner which can make it a little more challenging to add-in another chair. But you do get that extra table top space! Oval tables are predominantly supported by a pedestal-type base that extends the length of the table with the occasional post leg support available. All-weather wicker tables may have a skirt that extends fairly low so take that into consideration when looking at a wicker dining set if you have long-legged diners. Rectangle tables are mostly supported by post legs at each corner or by a cross-beam support or trestle. A cross-beam or trestle base may impede upon the space for knees and feet under the table and at the ends. Be sure to take into account the overhand at the ends of the table so there is sufficient room to pull your chair in close to the table top. Another support option that you will find is a center pedestal on small rectangle tables or double pedestals located at the ends of the table on large tables. 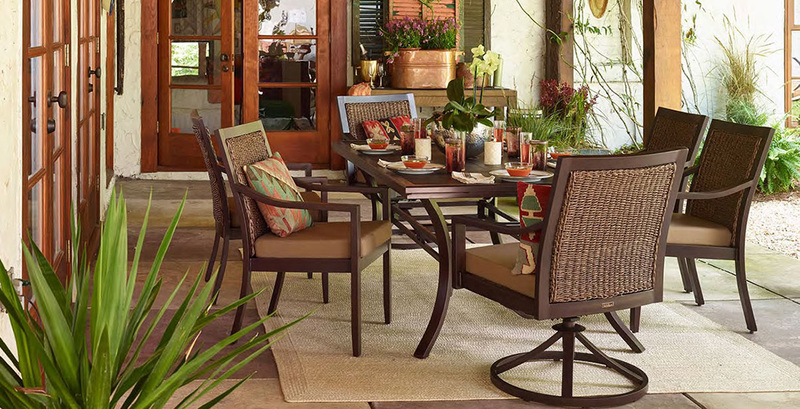 There are 3 basic types of patio dining seating to choose from: standard dining with 4 legs or sleigh base, swivel rocker dining chairs with a round base or a bench option. Although the standard dining chair is predictably the less expensive option, the other choices have their benefits. A sleigh base gives support from front to back which can be helpful on an uneven surface. A swivel rocker has a base that is stable on practically any patio surface while a standard chair may not be; plus, a swivel rocker requires less space in order to sit down thereby allowing you to accommodate a larger table in a smaller space and it’s a great way to relax after dining! A bench makes extra space available as your diners can easily slide in and out without having to move the bench. Now that you have an idea of the amount of space, how many people to seat, chair type and the shape of table you prefer, it’s time to determine what size will fit best. 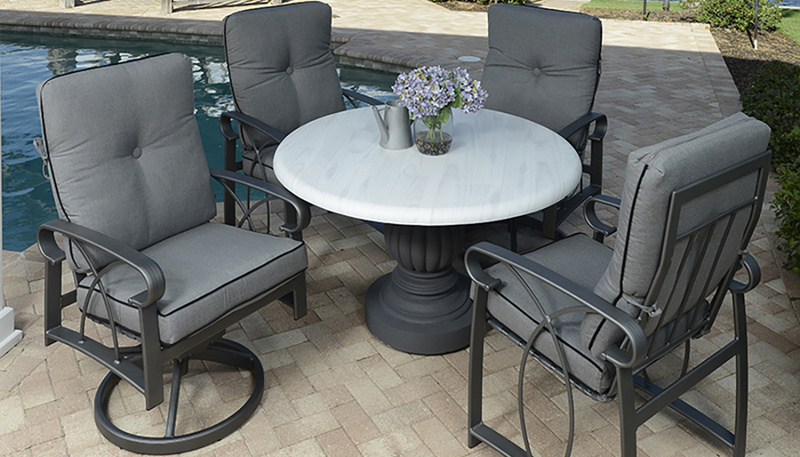 So, how much space do you have to place your gorgeous new patio dining set? In general, you need to allow the depth of the chair plus “scoot room” (the space you need to move the chair away from the table to sit down or walk behind) of 8 inches to the edge of the table top plus the width (or length). If you have a grill or outdoor kitchen in the same space as the table, be sure to allow room for the chef to move around freely. If space is limited, you can get by with the chair depth plus 4 inches or consider using a bench or swivel rockers instead. Dining chair depth will vary from 18 inches to 25 inches and you will need to take into consideration if you prefer chairs with arms or without which will impact the number of seats around the table. Your patio space is 10’ x 15’ without any obstructions other than the exterior doorway. Your chair is 25” deep and you would prefer a 48” round table to seat 4. Chair depth 25” + Scoot Room 8” + Table width 48” + Scoot room 8” + Chair depth 25” = 114” total inches or 9.5 feet. Since this is a round table, you would use the same measurement for length and width. This table would easily work in your space with enough room to enter and exit the dining area. It’s time to wrap up the number of chairs needed. A good rule of thumb is to allow about 2 feet of eating space per person. It’s okay to reduce that if you occasionally need to seat more guests but most people will prefer a little more elbow room. A round table doesn’t require much calculation as a 48-inch table seats 4, a 60-inch table can seat up to 6. Tables smaller than 48 inches seat 2-3. Rectangle and oval tables need a little more thought. Keep in mind most patio chairs with arms are 24-26 inches wide and it’s best to have a couple of inches at minimum between each chair. Tip: Rectangle tables less than 42 inches wide may not allow the placement of a chair at each end as there will not be sufficient dining space. Also, check the overhang at the end of the table with double pedestals, cross-beam or trestle support as there needs to be plenty of room for knees and feet! Your rectangle table is 72 inches in length and 42 inches wide. Following the rule of thumb, 2 chairs that are 25 inches wide will require a minimum of 54 inches. The maximum number of chairs around this table will be 6 with 2 on each side and 1 at each end. What’s the view from inside out to the patio? Determine the height of the chairs based on your desired view from inside the house. Most patio dining chairs are less than 3 feet in height, however, there are many styles available that can be as tall as 43 inches! These high back chairs offer maximum comfort and support for relaxing after dining or just hanging out on the patio but they may block your view from in the house. Likewise, the are so many beautiful fabrics and seat back styles available, a high back chair can also add to the beauty of the view! That’s all there is to it! Go pick out your outdoor furniture! Keep in mind how many people will be sitting at the table most of the time and how it will be used when not dining. If space allows, adding small side tables or accents tables to be used with the chairs away from the table is a great use of the space. If 4 or less people will use the table day in and day out, then an option would be to have a 36” or 48” table with a small bistro set to the side for extra guests when needed. Many manufacturers offer extension tables that can reach up to 102 inches for extra room on special occasions with enough space for everyday use. Combine an extension table with chairs that stack so you can easily store the extra chairs when not in use. If you do choose an extension table, be sure to allow enough room for the table and chairs when it is fully extended. We are happy to help you plan your space too! Bring in your patio measurements with the considerations designated and we’ll do the work for you. Or if you prefer, we are always happy to visit your home and work out a plan there. Call us at 225-450-6844 if you have questions or visit our showroom at 3005 W. Cabela's Parkway in Gonzales - we are next to Cabela's.